Jun 22nd 2011, 16:14 by P.K. THE first map of Arctic sea-ice thickness has been produced using data from CryoSat-2 (pictured), a satellite launched by the European Space Agency (ESA) in April last year. The map, unveiled yesterday at the Paris Air and Space Show, shows both the extent, and thickness in metres, of sea ice in the Arctic region. Images showing the extent of sea ice have been available for decades. The National Snow and Ice Data Centre tracks the Arctic ice-shelf using tools developed by NASA, and has produced monthly satellite maps going back to 1979. But this is the first map to address the thickness of the ice as well as its extent. The extent of the ice cap varies seasonally, and in September 2007 it reached its smallest recorded size. But to understand exactly how climate change is affecting the polar regions, the thickness of the ice needs to be known too. The project to map the ice’s thickness, proposed in 1998 by Duncan Wingham and his team at University College London, relies on data collected by the ESA’s satellite (the second of its kind, after the original was lost in a launch failure in 2005) from an altitude of 700km. 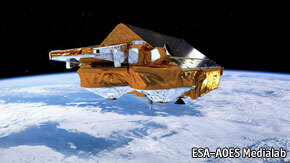 The satellite uses radar to measure its altitude above the ice sheet. Because the satellite’s altitude above sea level is known, the thickness of the ice above sea level can then be determined, allowing the overall thickness of the ice to be calculated. The first map, shown below, shows the average thickness of the sea-ice in January and February this year, as the ice approached its annual maximum. But the real value of the project will be the ability to map changes in the thickness of the sea ice over time, as further maps are produced. VIDEO: Watch our videographic on the receding Arctic ice-shelf, and the potential oil and gas reserves beneath. Posted on June 23, 2011, in research. Bookmark the permalink. Leave a comment.